Anodizing is a growing segment of the metal finishing industry. According to data collected by IndustryNet, the number of jobs has risen 0.48 percent in the last year. Sales have increased by 0.82 percent. The anodizing process deposits a layer of oxide on the surface of a metal. Processed parts form the anode in an electrical circuit, giving the treatment its name. The technique is performed in a tank in which the chemical composition and temperature are strictly controlled. Many companies employ either an on-site chemist or an outside lab to maintain optimal conditions. There are eight types of anodizing, as outlined in military specification MIL-A-8625. Three forms commonly seen are hard anodizing, dyed and nondyed. While this technology is most commonly applied to aluminum, it can be used with other metals as well, most notably, titanium for dental implants. Hard anodizing is performed at low temperatures. It forms a tough, corrosion-resistant and an attractive surface on aluminum. One popular application is on cookware. Dye is applied to an oxide surface and sealed. The most popular colors are black, gold and red. Gold dyed anodized aluminum provides a less expensive alternative to decorative plating. An unsealed anodized surface readily accepts printing. Silkscreen or sublimation may be used to apply vivid colors. Digital printing is increasingly also a method of choice. Images are produced on objects as diverse as baseball bats, motorcycle parts and architectural moldings. The leading anodizing companies profiled below illustrate a variety of specialties in the field. They top their sector either by the number of employees or physical size. These shops serve a wide range of industries. Valmont Coatings/George Industries provides 200 jobs in Los Angeles, California. The company's capabilities include clear, dyed and hard anodizing of aluminum. Finishes from marble to eye-popping colors for motorcycle parts are available to its customers. 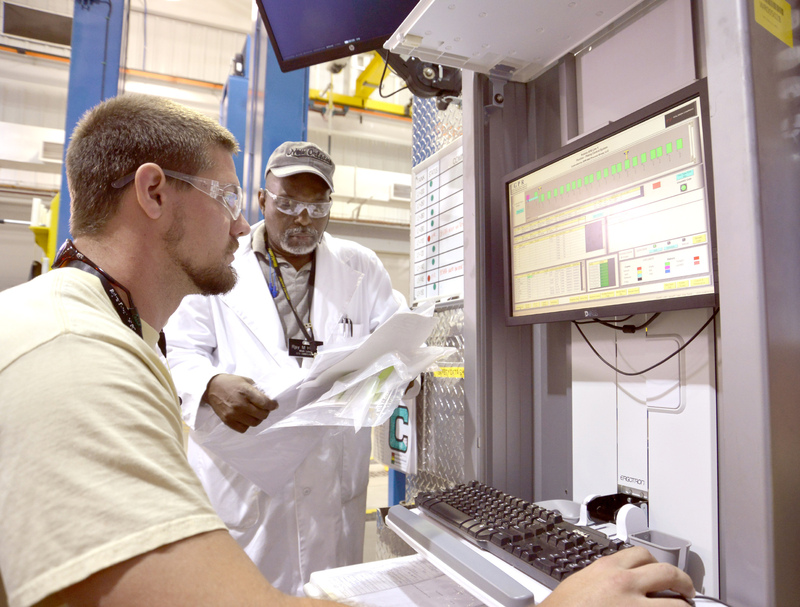 With 200 employees in Atlanta, Georgia, Southern Aluminum Finishing Co. Inc. (SAF), is an anodizing source for contractors, business owners and manufacturers. It is a member of the Aluminum Anodizers Council. SAF prides itself on meeting tight schedules and provides next-day shipping. AACOA Inc. is a division of Bonnell Aluminum. In its state-of-the-art plant in Elkhart, Indiana, 200 employees provide customers with both clear and colored anodizing services. The facility is ISO 9001:2000 certified. The 195 employees of International Hardcoat Inc. in Detroit, Michigan, perform both hard and clear anodizing. Utilizing its Pixodize™ process, this company can infuse almost any graphic image onto an anodized surface. The shop is Nadcap, ISO 9001:2015 and ISO 14001certified. Both clear and hard anodizing of aluminum are executed by the 175 employees of Buckeye Anodizing and Stamping Co. in Kings Mountain, North Carolina. Buckeye uses silkscreening to print graphics on baseball bats as well as logos and nameplates. The facility is certified to ISO 9001:2008. O-Flex Metal Finishing Inc. maintains a 300,000-square-foot plant in Clanton, Alabama. The company provides anodizing services on automotive parts. It celebrated its 20th anniversary in 2017. Four companies that led by the number of employees, as highlighted above, also head the list in plant size. The shop of Southern Aluminum Finishing covers 200,000 square feet, Buckeye Anodizing and Stamping, Co. occupies 175,000 square feet, and the facility of AACOA Inc., encompasses 117,000 square feet. The automated and semi-automated lines of International Hardcoat Inc., extend over 104,000 square feet.